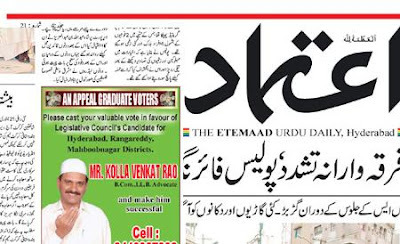 I often see Etemaad (Urdu) newspaper of Hyderabad and for the last few weeks, this advertisement has been a regular feature. Mr Kolla Venkat Rao, wearing a 'topi' and appealing to voters in English to cast their vote in his favour for the legislative council from Hyderabad, Rangareddy and Mahboobnagar districts. Sort of liked the picture. The smile and the Aadab. Rao sahab has also got his cell phone number published with this advertisement. The day I receive 50 calls, my head begins to spin. I wonder how these people cope. Though if a politician wears a fez or skullcap, it doesn't impress me much. Still, I haven't seen such advertisements in Urdu papers in any other city. I have also seen billboards with Andhra Chief Minister wearing the topi and wishing the Hajis during my visits to Hyderabad in the past. Site against fundamentalism and extremism. This website stand for communal harmony, India's composite culture, Hindu-Muslim unity and humanism. Why is this blog titled anindianmuslim.com? If you are copying a paragraph, part of any article from anindianmuslim.com on your site [or book] or using an excerpt from a post on this blog, kindly give credit in the form of the name of this blog and its link. Thanks. Who says Muslims don't oppose MF Husain's paintings? Why TV channels ignore Chhamman Miyan? Halaku, if you visit Baghdad again! Who would't admire Mohammad Rafi? Welcome to Indscribe's blog that stands for Humanism. Click to Read 1000 past articles and list of posts published in the last 12 years on this blog. Yet another lynching bid in Alwar, Sagheer survives: Will Congress government in Rajasthan rein in the cow vigilantes? 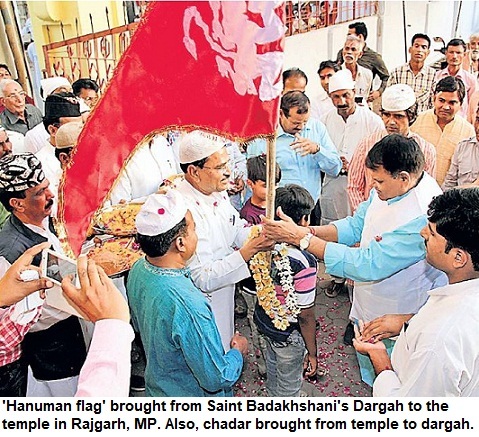 Tharpakar: Hindu majority district in Pakistan! Chandrashekhar Azad or Chandrashekhar Tiwari!